The re-introduction of ZUPCO buses to ply urban routes in the aftermath of January fuel protests was a welcome move for most urban commuters. This is largely because commuter omnibus operators had taken advantage of the fuel price hikes and inflation to charge commuters $5 to $8 for urban trips with distances less than 30km. Government intervened swiftly by hiring over 247 buses at a flat rate of ZWL$700/day with subsidized fuel provisions via Petrotrade and CMED. The buses charged ZWL$1 to $1.50 per trip and managed to force commuter operators into lowering their charges to the same amount immediately after introduction. However the scheme seems to be dying a slow death within 2 months of introduction amid claims of fuel pilferage, political mudslinging and non-payment of hired buses. Regardless of the reasons, the key take away from that intervention is that Zimbabwe needs a modern urban transport management system that includes buses, train services and commuter omnibuses so as to maintain competitiveness and the cost of committing for citizens. The spike in road accidents, the disorder caused by commuter omnibus operators in the city centre and their clear disregard for traffic rules is a cause for concern for all. A closer look at the ZUPCO intervention scheme in January points to prevalent flaws that are evident across most government policies and points to lack of due diligence before policy pronouncements. The 247 buses hired at an average cost of ZWL$1000 per day (Diesel at 100 litres per day @ $3.10/litre plus hiring charge) mean that the government shelled not less than $6 million in a month before ticket returns are factored in. These have not yet been stated. The scheme had been structured with the view that the buses would run 9 roundtrips (18 trips in total) without taking into consideration that smaller omnibuses average less than 9 roundtrips per day because of congestion, low demand during off peak hours and the state of urban roads. The planning did not take refueling time and the fuel shortages into the equation as well. It was inevitable that commuter omnibus operators were going to lower their prices to match ZUPCO or charge below $1 per trip to lure customers in a competitive retaliation move. Urban commuters naturally prefer faster and convenient models of transport despite the accident risks that commuter omnibuses pose. This is why pirate taxis have become a hit in most urban roads and on the highway. The revelations by the ministry of local government that the government was spending $3 million net per month to hire the buses confirms the flaws of the scheme at face value before other project control and revenue assurance loopholes are weighed in. The scheme was unsustainable from the onset and needs to be rejigged if ZUPCO is to venture into urban transportation in the short term. Buoyed by the positive response from urban commuters, the government recently announced that it had procured 700 buses from Belarus and South Africa to expand the urban transportation model. It is not clear whether the partial privatization plan will see the light or it has been temporarily shelved. The privatization route itself could have raised the ire of ZIMRE Holdings Limited which bought 49% shareholding in ZUPCO from United Transport Group in 1995. The shareholding structure is not clear as government claims to have acquired 100% of the company in 2006. If the ZIMRE position is correct, then ZUPCO is already partially privatized and ZIMRE should be involved in any recapitalization strategies. However it is critical to evaluate why ZUPCO is in a perennial loss making position despite receiving more than 350 buses between 2011 and 2015. The company has debts of more than $16.1 million as of December 2018 and operates less than 56 buses with a staff complement of 351. At the core of the company’s woes is political interference, management and corporate governance deficiencies where ZUPCO rendered services but never got paid for those services or offered subsidized services at the behest of politicians. This may be recurring phenomenon that will not die away because a new fleet has hit the road; it may actually worsen if control measures are not put in place to instill corporate governance ethos. The partial privatization route definitely got a lot of investors interested with 22 investors expressing interest to invest in the company. The debt issue or the unclear shareholding structure could have soiled any serious investment. One of the key aspects that government needs to seriously consider is the model of buses it procures in terms of mechanical quality. Adaptability to Zimbabwean temperatures and roads is of utmost importance considering the rural routes ZUPCO plies which remain very important to urban-rural travelling. 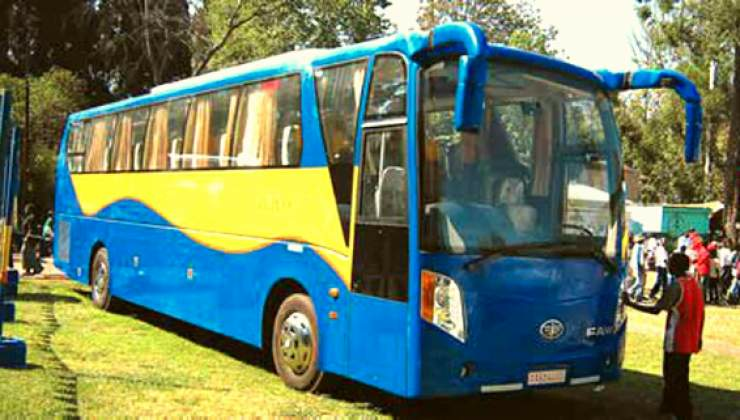 Procuring poor quality buses from abroad after shunning local suppliers such as Quest Motors, Deven Engineering and AVM is a slap in the face by the government considering the fact that these suppliers desperately need that coveted foreign currency to buy raw materials. These suppliers are also struggling to stay afloat due to the harsh economy, maintain their employment levels and pay taxes to the same government. Long term supply contracts with these local firms would go a long way to improve their quality and production capacity. After all AVM’s Transliner Buses fare better than FAW buses procured by ZUPCO in recent years in terms of durability, interior and exterior design. Even though the recent ZUPCO intervention was well received by commuters, the government should not be blinded by populist policies that pile more debt on the loss making entity and miss the investment opportunities that beckon through partial privatization. Funding a loss making entity or bringing in more buses does not translate to profitability. Even if the company is still very relevant to the proposed urban transportation system and long distance routes, it needs to be operated efficiently. Transport is a game of economies of scale and optimum efficiency. Only through sound corporate governance practices, astute management and a profit oriented model can ZUPCO be turned around. The corporate governance issues at ZUPCO mirror the challenges with most State Entities and Parastatals (SEPs) and these may continue to bleed the taxpayer as long as key reforms are not executed prior to any recapitalization deal. Recapitalizing ZUPCO in its current state is similar to taking 3 steps backwards after making one bold step in announcing a well-received partial privatization policy under the Transitional Stabilization Programme (TSP). Victor Bhoroma is business and economic analyst. He is a marketer by profession and holds an MBA from the University of Zimbabwe (UZ). For feedback, mail him on vbhoroma@gmail.com or alternatively follow him on Twitter @VictorBhoroma1.